I was in my element last Saturday. I had volunteered to provide flowers at church last Sunday in memory of my parents and decided to create a bouquet myself rather than order one from a florist. One, it was a peace offering. The story that was to be published on November 2 pokes gentle fun at my parents. I didn’t reveal anything that they had been trying to keep a secret, really, but I told the story in a bit of a cheeky way. I hope they wouldn’t be offended if they were still around to see what I was up to. Here’s the link to the story. Two, I knew I would be thinking of them for other reasons. A fiddler who plays gospel, country and folk music was going to be a guest musician at the service. The last time that happened, I could hardly contain my feet from tapping as I heard my father saying, “Fill up the floor for a square dance.” He and my mother taught square dancing to school children and seniors as a hobby after he sold his dairy herd. They even cleared the table away and conscripted guests to square dance in the kitchen of the farmhouse. Their antics brought a lot of joy and some embarrassment, too, I’m sure. They meant so well that no one complained. A store-bought bouquet just wouldn’t do. I found a corner store and flower market that had sunflowers, chrysanthemums, cattails, Chinese lanterns, and some greenery and came home pleased as punch to arrange them. Just as I’d seen my mother do with flowers she had grown and otherwise procured for her church on countless occasions. I swear I am channeling her at times. 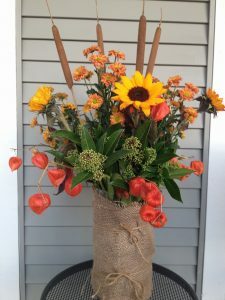 This entry was posted in Writing and tagged channeling, flower arrangement, square dancing, store-bought on October 30, 2016 by Wilda.